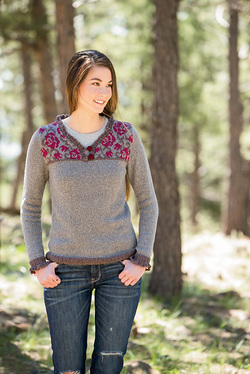 Published in Interweave Knits Fall 2014, the Climbing Rose Henley can be purchased through the Interweave Store as a digital copy or print copy. A tweedy silk blend, demure ruffles, and stranded flower motifs give the Climbing Rose Henley feminine appeal while upholding the sporty look of the traditional Henley. 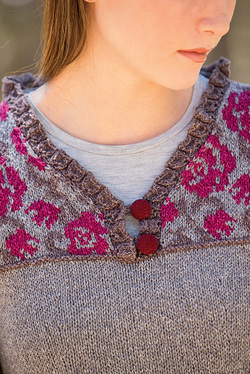 The yoke is steeked to keep the colorwork straightforward. Finished Size 36 1/4 (40 3/4, 44 1/4, 48, 52 1/4, 56 3/4)” bust circumference. 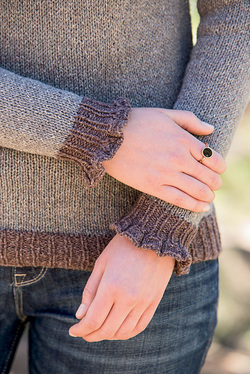 Pullover shown measures 36 1/4”, modeled with 2 1/4” of posi­tive ease. #96 magenta (CC2), 1 skein. Needles Bands—Size 4 (3.5 mm): 24” circular (cir) and set of double-pointed (dpn). Body and sleeves—Size 5 (3.75 mm): 16” and 24” cir, and set of dpn. Adjust needle size if necessary to obtain the correct gauge. Notions Markers; tapestry needle; sew­ing needle; two 3/4” buttons. Gauge 22 sts and 32 rnds= 4” in St st on larger needle; 24 sts and 28 rnds= 4” in charted patt on larger needle.